When Brad Scheer ran out with the Palm Beach Currumbin Lions two and a half years ago, he was not only debuting, he was making history. At 15 years old, he became the youngest ever senior player at Salk Oval. The world was at his feet. Fast-forward to today, he is no longer that fresh-faced kid punching above his weight, he is a young man whose life might be about to change forever. The 2016 NAB AFL Draft is just eight days away, and Scheer could be about to go from a kid who kicked the ball around all winter in country Western Australia to an AFL player. While his senior football debut might not have gone completely to plan, it didn’t take long for him to announce himself as a star of the future. “It was an amazing feeling. To be the youngest ever to debut was incredible, but the game itself was probably one of my worst ones. My first kick at goal was on the final siren, but I was lucky enough that Crezza (coach Darryn Cresswell) gave me the chance to play the next week and I managed to kick five goals. I owe him for that second chance,” Scheer said. 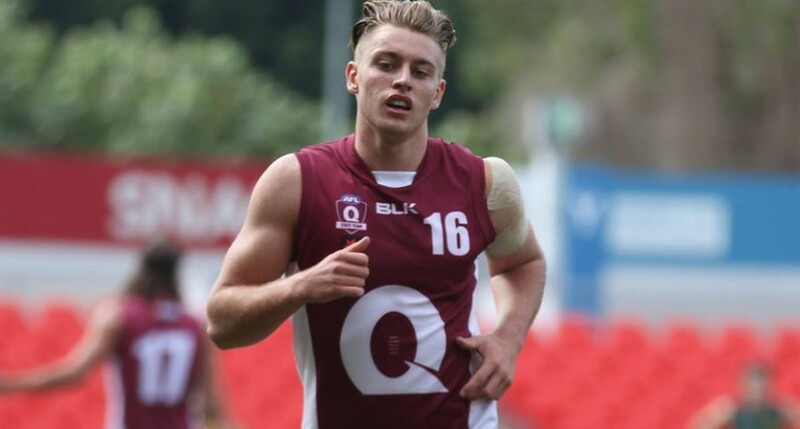 That second game netted him a QAFL Rising Star nomination, an award he would win at the end of the season. To be honest, nothing has changed since. He is a prolific ball winner, hard-nosed, has strong hands, and knows where the goals are. He is ready made. Let’s take it back to the begging now… let’s understand how he got to where he is. “I was probably kicking the footy as soon as I was born, especially coming from Western Australia. I had no choice really, in a small country town in winter it’s AFL and in summer it’s cricket. It started in the backyard with my brother, and then I started playing Under 12’s when I was 8,” Scheer said. His talent was obvious from the start, proven by his selection in the Western Australian Under 12 team. It was at that point there was a shakeup in Brad’s life, and one in hindsight that was for the better. Scheer’s parents, Joanne and David, believed the best pathway for his football was in the opposite corner of the country. “The main reason I moved was to go to Palm Beach Currumbin State High School, and the AFL program that had there. I settled in quite quickly so started playing for the Palm Beach Currumbin Lions across the road,” he said. “I’m not sure I would have made it if we didn’t make the move to Queensland when I was 12. I obviously didn’t want to move away from friends but they thought it would be best for me. Mum taught me a lot about fitness, about being self-driven, and then Dad taught me everything about the game. Now this is when it all starts getting very serious. This is when Scheer truly believe if he put his head down something special might happen. The first step was making the Queensland Under 15 Schoolboys team, which led to selection in the Queensland Under 16 team, and SUNS Academy. “As a young kid you always dream about it, and it’s always something I wanted to do, but you don’t know how realistic that is and how much hard work you’ve got to put. It was probably in my Under 16 year with Queensland when I won the Division Two MVP that I really started to believe I could make it if I kept working hard,” he said. 2015 promised a lot, but definitely didn’t go to script. A groin injury restricted him to just a couple of games. That didn’t mean he dropped his head and felt sorry for himself. He showed his maturity by doing what he needed to do and taking any positive he could from it. “It was a really frustrating year. It was probably my first injury where I had to sit on the sidelines for a decent amount of time. That was about three months, and it was probably something I had to experience to be honest,” Scheer said. 2016 has been much smoother. He was a key player in the Queensland Under 18 team, was picked for the Allies team, and earned a starting spot in the SUNS NEAFL side. “I was pretty happy with my year. I was mostly happy with the backend of the NEAFL though. I came back, got a Rising Star nomination, and had a starting role in the midfield. I took a lot out of that. A few of the wins with the NEAFL boys really stood out for me,” he said. He credits the development in his game to his time with the Queensland and SUNS Academies. “They are both elite programs. They taught me elite habits and it was great to be around players that have already been drafted. Being in the same team, it gives you a lot of hope and confidence that it could happen to you as well,” Scheer said. With D-Day just around the corner, it was clear how much being drafted would mean to him by the sigh he let out before he could talk about it. “It would be a dream come true. I try not to think about it because the more you do the longer it’s going to take to get to Friday. It will definitely be emotional because it’s something I have wanted to do for so long. It will mean a lot to me, my friends, my family if it does happen. As a Queensland kid hopefully it shows to the juniors that if you put the hard work in you can do anything a Victorian or a South Australian does,” Scheer said. As much as he tries to stay in the moment, Scheer said it’s impossible not to imagine running out as an AFL player. “I probably think about it a lot to be honest. I was on the plane last night, it was dark, and it crept up on me out of nowhere. It’s so close now. You sit there day dreaming about the chance you might have to do this for a living,” he said. Well he won’t have to wait much longer. The 2016 NAB AFL Draft will take place next Friday night, November 25. Will he get picked? Will the SUNS take him, or will he be on his way to another club? Only time will tell.